Similar to document segments, memos can also be linked to a code. You can do this via the code Quick List, which is symbolized by the blue arrow in the memo toolbar. Clicking on this symbol opens the most recently-used codes, so you can choose which ones to assign to the memo. If the code you are looking for is not in the Quick List, simply click on the code in the “Code System” and try again. The code should now be listed at the top of the list. The linked code is then displayed with its complete path (codesubcodesubcode) in the Codes area in the top right of the memo window. If you later decide to remove a linked code, simply click on the code in the memo window and click on the toolbar symbol of the blue arrow with a red x on it. Codes can be linked to memos in order to indicate what the memo is about. Of course, you can choose a descriptive title for a memo, based on the content of the memo, but to attach codes is a more systematic way to attach more thematic topics than could be formulated in a memo’s title. To find all memos that are linked to the same code, right-click on the code in the “Code System” and select Overview of linked memos from the context menu that appears. The result is a table of memos. The table contains all the memos to which the code is attached. As usual, double-clicking on a row opens the memo and a single click brings the source document into the “Document Browser” window. The table can be sorted according to its columns and it can be exported to other programs. Open the Overview of Memos via the Reports tab. 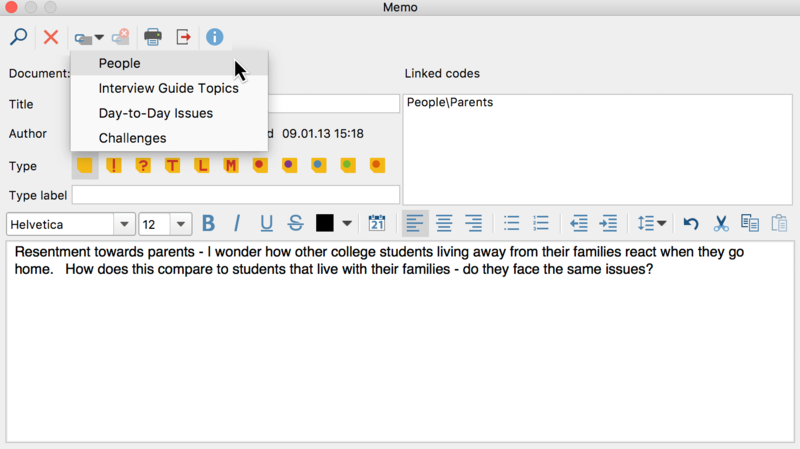 From the drop-down menu in the toolbar, select Memos of activated codes to filter the memos. With the filter switched on, you can also activate and deactivate codes later – the Overview of Memos then displays the appropriate memos.